Today (19 April 2017) we reveal that 62 per cent of UK adults are not aware that a lack of regular physical activity increases the risk of bowel cancer – the nation’s second biggest cancer killer. Research shows that taking part in regular physical activity, which is 150 minutes of moderate aerobic activity such as cycling or fast walking every week, can decrease your risk of bowel cancer by as much as 12 per cent. Astonishingly, a recent survey revealed that more than 20 million people in the UK do not reach or exceed this minimum target. 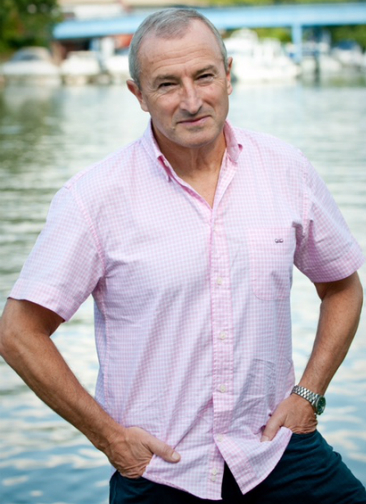 Every year 41,200 people are diagnosed with bowel cancer, it’s the fourth most common cancer. Scientists think around half (54%) of all bowel cancers could be prevented by having a healthier lifestyle such as maintaining a healthy weight, taking more exercise, cutting down on alcohol and stopping smoking. 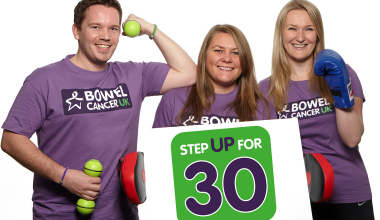 We commissioned the poll to launch our latest fundraising challenge, Step up for 30, and to encourage people to take up regular exercise and be more active to reduce their risk of bowel cancer. It’s really simple, just get sponsored to do 30 minutes of physical activity every day for 30 days in June. Every 30 minutes someone dies of bowel cancer in the UK. Whilst you’re getting fitter and feeling healthier, you’ll be raising money to support vital research and lifesaving work to help stop bowel cancer.